We have two connected barns with a total of 31 stalls, ranging in size from 12' x 12' up to 12 1/2' x 16'. All of our stalls are fitted with 3/4" rubber mats over compacted sand for comfort, and are generously bedded with shavings. Both barns are well-lit and airy, with pine tongue-and-groove stall walls and high ceilings with skylights in addition to lots of lights. 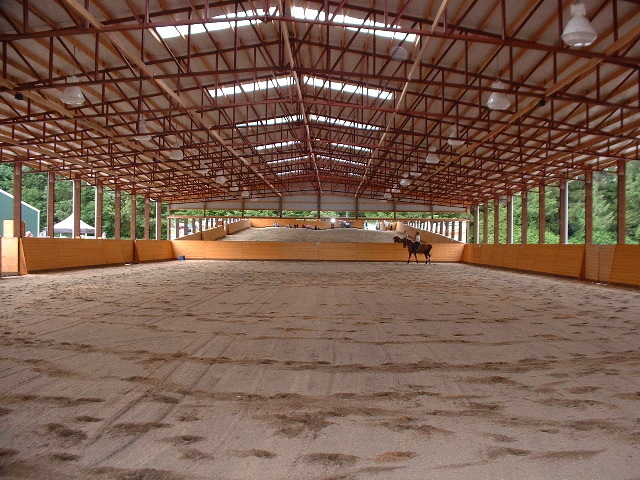 The main barn has two large washracks and two large grooming areas, with an additional grooming area in the lower barn. These are all covered with rubber mats, as well. The washracks have an on-demand water heater (which we also use to provide every horse with warm water throughout the winter to promote excellent hydration) so you never have to worry about running out of hot water partway through a bath. Not everything is just for the horses' comfort - in addition to heated tack rooms, a heated bathroom, kitchen, and lounge are provided for boarders and visitors. We are very proud of the footing in our 80x204' covered arena. We use a mixture of sand and rubber over a base of compacted crushed rock. We water it as needed, fluff it daily using a professional drag, and have it releveled several times a year. This provides an extremely consistent, firm yet resilient footing comparable to the best we've seen anywhere in the country. This gives the horses great stability and confidence so they can focus on their training. The entire width of one end of the arena is covered in 8' tall mirrors (640 square feet!) for excellent visual feedback no matter where you are in the arena. Visitors also often remark on the quality of the lighting. We carefully designed the height, spacing, and intensity of the 20 lights to provide bright, uniform light throughout the arena. Finally, we have a custom-designed sound system with speakers spread throughout the arena for high-quality, even sound distribution -- essential for practicing Musical Freestyles, but also really nice for clinics or just to listen to music while riding. We also have a covered 20m "round pen" with bright lighting and sand footing for lounging, in-hand work over poles, warm-ups, turn-out in inclement weather, or just a more isolated ride. The round pen footing is also groomed daily and levelled and "fluffed" as needed. Traumhof has 18 hog-fuel paddocks with 2"x8" white vinyl fencing for daily turnout. We are fortunate to live on very well-drained land so despite our rainy climate the paddock footing is never muddy. The paddocks are picked daily and footing replaced annually to ensure that they remain in good condition. We have recently added the Horse Gym 2000 treadmill to our facility. This is the same treadmill used by Steffen Peters and his team at Arroyo del Mar - in his interview just before winning the World Dressage Masters he mentioned it as one of the primary training adds that he attributes Ravel's recent improvements to. The treadmill builds muscle evenly side to side in a way that you can't with a rider or tack on their back. It builds long lean even muscle. Rudi (one of our horses) has always leaned toward an uneven walk while under saddle. It can be ridden out of him and for the most part he doesn't do it any more once he's warmed up. However, I found it very interesting that when we first put him on the treadmill he did that same skip in the walk (almost as if he wants to pick up the canter). After a month or so the even conditioning of the treadmill has eliminated that entirely - at this point he is walking heel toe evenly on all fours at a pace of 104 m/min. In addition to variable speeds, the Horse Gym 2000 offers several incline levels, powered by a hydraulic system, so they can be automatically changed over the course of a workout. In the video mentioned above Steffen said that Ravel has just started doing the incline. We are just starting to experiment with it as well. This is the same training program used by Steffen Peters. We were introduced to this exact treadmill while at his farm training last year, and loved it so much we bought one for Traumhof. Steffen, Shannon and David Blake all swear by it. It is used IN ADDITION to correct under-saddle training, of course, but what a great addition! We also find it very helpful when we have inclement weather that keeps the horses inside - in addition to hand walking we can use the treadmill to give the horses plenty of exercise. The horses seem to really enjoy the treadmill, as well. They'll charge up the entry ramp and paw impatiently for it to start while we hook up the safety gear! For more information, see the Horse Gym 2000 website. It's a little confusing - the actual model we (and Steffen) have is the "S3 Automatic USA" which is the second on the treadmills page. The newest addition to our facility is the TheraPlate Revolution Equine Therapy Platform. This type of therapy has a well-documented track record (the TheraPlate website cites over 200 peer-reviewed studies) of helping both humans and animals recover from injuries as well as develop and maintain healthy bodies. Most of the horses clearly recognize the benefits - they eagerly rush into the stall where we have it and step up onto the plate. Danny, who has a long history of hoof complaints, is a particularly big fan, and it has eliminated the granulation on his hooves, where no other therapy had had any significant impact! We (and many of our clients) have also enjoyed using the TheraPlate ourselves, both to help relax sore muscles and to promote better fitness and health. In fact, we're now helping distribute them to other barns since we have seen such amazing benefits from ours. See our Theraplate page for more details.